As the social networking wave continues to grow, sites such as Facebook and Twitter are attracting more than just party-seeking college kids and chatty tweens. In February 2007, a young political official wondered social networking might help him take on a battle for high leadership. His hope was that social networking, with its unmatched communications and database capabilities, would help him overcome tremendous odds. I guess Barack Obama was right. Obama’s election campaign was record-breaking in more ways than one. Not only did he become the first African-American presidential nominee in U.S. history; he also rallied an unprecedented number of volunteers — over 8 million, and received a record amount in donations — around $750 million, finishing with over $100 million in the bank. His campaign’s success may have been a direct result of his grass-roots campaign strategies – and a clever use of the internet and social networking, which provided a constant flow of communication between his team and voters. He was able to get in touch with the American people in a more direct, personal way. My mom, an ardent Obama supporter and campaign volunteer, would receive emails from Obama and his wife, Michelle constantly throughout the election. Obviously, these were mass emails sent by his team, but they were addressed to my mother and “signed” by Obama. It was a small, personal touch that mattered. When I last logged in to my Facebook account, there were over 500 Obama-based groups, including “Obama Democratic Club of Silicon Valley” (322 members), “Obama for President!! !” (40,997 members), and “One Million Strong for Barack” (978,826 members). 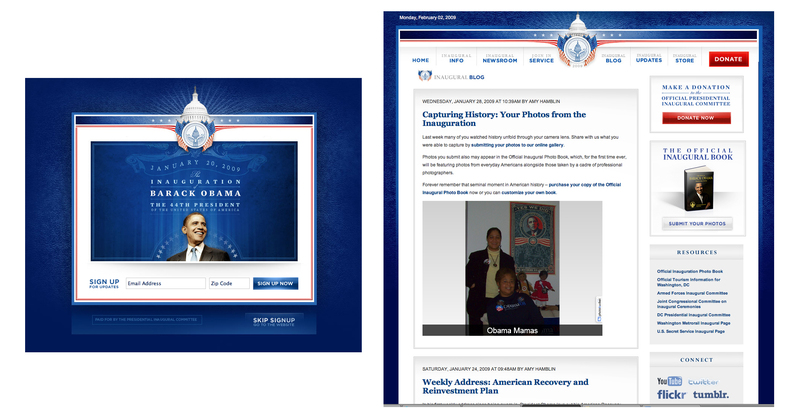 And after he was elected and inauguration planning began, Obama’s Presidential Inaugural Committee (PIC) launched a campaign-style social networking web site, pic2009.org. The PIC even created an inaugural blog, which covered the inauguration plans and events; now it posts photos sent in by people who attended the inauguration. And if you scroll down to the bottom of the sidebar, you’ll see an area called “Connect,” with links to YouTube, Twitter, Flickr, and Tumblr. Yes, Tumblr was new to me, too! Social networking will likely be a big part of Obama’s presidency, and I think people are ready to embrace a social president. At least I know I am; mental note: post my inauguration pics on the PIC blog and investigate Tumblr.